It was an engaging talk, though personally I'm more interested in specific technique. Clearly many others were ready to sit down and get a long talk, as even when he asked for questions, many of them were about street fights. There was some technique in there too, focusing around the guard. Haueter's first point was the importance of hips, head and hands, the old school approach to grappling. If somebody is trying to punch you, it makes sense to control their hands, head and hips, as then they will have trouble whacking you. Controlling the head means they can't headbutt you, a tactic that used to win a lot of MMA/NHB fights back in the day (Mark Kerr and Mark Coleman were especially successful with it). There were lots of other interesting tidbits that came up. He mentioned that while he used to be a strong believer that everything he did should work in both nogi and gi, he has changed his mind. When standing, he recommends staying on your toes (similar to how you should be on your toes when inside closed guard too). He talked about four 'pressures' in the guard: chokes, joint lock, sweeps and standing up. The idea here was that the person on top has to hold you in guard, as otherwise you will move around that guard (e.g., stand up, move to the side etc). Haueter also likes to get their gi out of the belt as soon as he can, from standing. That's where he got into his first 'proper' bit of technical demonstration, on a palm up, palm down choke in the closed guard. Grab their same side lapel and same side sleeve, aiming to lock that forearm against your stomach. 'Cast' the lapel slightly open, like you're casting a line when fishing. Insert your arm gripping hand into that collar you've opened up, as deep as you possibly can. Your arm is extended, which Haueter uses to block any punches on that side. He then swings them to the other side, swinging his body underneath in the opposite direction, elbow into their sternum. Your free hand grabs the material by their opposite shoulder, then drop that elbow into their sternum too. Square back up and choke. He also discussed lapel guard, much to my surprise. It was cool to see how somebody with a solidly old school mindset approaches a new school technique. Pull out both of their lapels, gripping inside their arms, while they are in your closed guard. Pull out as much as you can on one side, gripping that with both of your fists. Move that off onto their arm, which can lead into all sorts of chokes. You can try reaching an arm around their head, passing the gi tail to that hand and locking it off. Your other hand stays inside, under their chin. Drive that chin-hand up while pulling with your gi grip for the first choke. Another option, bring their gi around their head instead of your arm, gripping the end with your same side fist. This time, you close off the choke by grabbing your gi-gripping wrist with your other hand to bar across their neck. Pull the gi and apply pressure with your arm to finish. It's even possible to simply wrap the gi all the way around the neck, getting the pressure from ratcheting your arm with a single hand gripping. You can also attack the arm, wrapping the gi tail over their upper arm, then pushing their wrist: the gi becomes the fulcrum for the joint lock. 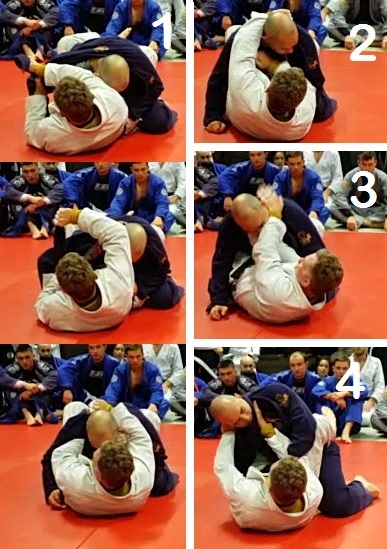 You can use that same gi grip to stop their arm posting, moving into a scissor sweep. First off, keep them constantly off balance. If they are leaning in towards you, attempt to lift them up, possibly even over your head (Haueter used a de la Riva hook to help with that). If they are leaning back, he keeps the pressure, holding the heel of the knee you want to cut, also with a firm grip on the other lapel. Should they manage to start that knee cut, make sure they can't push your opposite should flat, as that really stuffs your counters. If they pull up on your arm, even worse. Thanks for the great breakdown. It really is a nice gi. Haueter is certainly articulate, entertaining, and knowledgable.